St. Maelodhrain, of Slane, County of Meath. At the 31st of May, the Martyrology of Tallagh records an entry, regarding Moelodran of Slaan. The Bollandists have as a festival, at this date, Moeldranus Slanensis, and following the same authority. This place —deriving its name from Slanius a former monarch of Ireland —was situated near the River Boyne, and in the County of Meath. It is now known as Slane, where it is said St. Herc, or St. Erc, became its first bishop, in the time of St. Patrick, by whom he had been consecrated. To St. Erc is attributed the foundation of a hermitage near the beautiful Hill of Slane, over the winding and picturesque course of the Boyne River. It is situated to the south of the town, and it is said, but incorrectly, that Regular Canons of St. Austin were here established. It was celebrated during the early ages of Christianity, and according to tradition, Dagobert, King of Austrasia, was here educated. Slane was frequently pillaged, by the Northmen. The Franciscans seem to have occupied the hermitage of St. Erc during the middle ages. The hermitage lies within the Marquis of Conyngham's Demesne, on the northern bank of the river, and immediately below the castle, embosomed within the dark shadows, in a grove of ancient yews. Considerable portions of this picturesque building still exist. Near the site of his original church are the ruins of a fine old Franciscan monastery, founded A.D. 1512, erected by Christopher Fleming, Lord of Slane, and by his wife, on behalf of two Franciscan Friars, who then dwelt in St. Erc's hermitage, and for the order to which they belonged. This Priory was suppressed, in the 38th year of King Henry VIII., and it was re-granted to the Flemings, whose possessions were forfeited to the crown, after the Insurrection of 1641. On this day, a festival to honour Maelodhrain, of Slane, was celebrated, as we read in the Martyrology of Donegal. With his parentage and period, we are not acquainted. St. Fergussius, of Druim-Bile, otherwise, St. Saergusa Bile, or Saerghos, of Druim. St. Commain, Virgin, of Dal-Buinne, and of Derry, Parish of Ballyphillip, County of Down. From the way, in which this holy virgin's name has been noticed in a stanza of that metrical Calendar, we infer, she was a daughter of Aillen, or Allen. In the Martyrology of Tallagh, at this date, the entry is, Cumne, Virgin, i. Ingen Alleain, in Aird Ulladh. The Bollandists notice her, at the 29th of May, as Cumania, filia Alleani in Ardvladh, while quoting the same authority. She descended from the race of Fiatach Finn —head of the Dal-Fiatach and monarch of Erin—in this wise. Her father Aillen was son of Baedan, son to Echaid, son of Brian, son to Enna, son of Cathbu, son of Echaid Gunnat, son of Fiacc of Dal Fiatach. In another place, she seems to have been connected with a church, in the territory of Dal-m-Buinne—in Latin Dalmunia—but the exact site is now unknown. To it, allusion appears to be made, in the "Felire" of Aengus, at the 29th of May. An alternative conjecture of a commentator seems to be, that a Cill Ingen Aillen, in Idrone territory, county of Carlow, may have been her place. The church of Cumain, as we are told, lay in the Ards of Ulster. Her place has been identified with Derry, "an oak wood," and a townland in the parish of Ballyphillip, County of Down. The surface of that parish forms a chief part of what is called Little Ardes, and it lies between the neck or sound of Lough Strangford and the Irish Sea...Here, the virgin's feast was formerly kept, as a gloss on the Martyrology of Aengus states...Also, on this day, veneration was given, as we read in the Martyrology of Donegal, to Commain, Virgin, of Daire-inghen-Allen, in Uladh. The Seven Bishops, of Tigh-na-Comairce. At the 28th of May, the Martyrology of Tallagh registers Secht n. Esp. o Thigh na Comairce. The Bollandists have a notice - on the same authority - for the Seven Bishops of Teg-na-Comairre, at this date. As will be seen, there is probably a typographical error, in spelling the name of this locality. The place is said to have been within the present parish of Clonleigh, in the barony of Raphoe, and county of Donegal. There is a Tigh-na-Comairce, in Tir Conaill, near to Loch Feabhail - now Lough Foyle - as we are told by the O'Clerys. The Martyrology of Donegal, on this day, records a festival, in honour of the Seven Bishops, of Tigh-na-Comairce. Under the head of Teach-na-Comairce, Duald Mac Firbis enters, the Seven Bishops from Teach-na-Comairce, at May 28th. We are informed, likewise, that Teach-na-Comairce is in the parish of Clonleigh, and in the county of Donegal. St. Ethian or Ethern, Bishop of Donoughmore Mic-Laithbhe, in Mughdorna. In the Martyrology of Tallagh, this saint's name appears, at the 27th of May, as Ethirn, Bishop of Domhnach mor. On the same authority, the Bollandists enter Ethernus, Episcopus de Domnach-Mor. There was a Mughdhorna-Breagh in Ireland, but its position is not well known. From the church of this saint having been here placed within the territory of Mughdorna, Dr. O'Donovan thinks it highly probable, he must have been connected with Donoughmore, near Slane, and in the county of Meath. The Martyrology of Donegal enters a festival on this day, in honour of Ethern, Bishop, of Domhnach-mór-mic-Laithbhe, in Mughdorna. Under the head of Domhnach-mic-Laithbhe, likewise, Duald Mac Firbis enters Bishop Ethern, for May 27th. St. Criumther Cael, of Kilmore, Probably in the County of Cavan. An entry appears, at the 25th of May, in the Martyrology of Tallagh, regarding this saint. There too, he is said to have been connected with Cill moir, which corresponds with the modern Kilmore. The Bollandists, on the same authority, record his name as Crumtherus Coel, sive Presbyter, at this same date. It is probable, that what follows is only a double entry of this feast, viz., Coelius de Killmor. This place was probably Kilmore, the seat of the bishop's See, in the present county of Cavan; although, this is by no means certain, for many other places in Ireland have received a like name, owing we suppose to the fact of a great church having been erected, in each place so denominated. On this day, likewise, the Martyrology of Donegal mentions the veneration of Cruimther Cael, of Cill-mor. In the Martyrology of Tallaght, at this day, we have "Secht ningena Fergusa in Inis Cealtra." In that of Donegal, "The seven daughters of Fergus of Tigh-ingen-Ferghusa". Alexander Penrose Forbes, D.C.L. Bishop of Brechin, Kalendars of Scottish Saints, (1872), 447. His source, V.D.A., View of the Diocese of Aberdeen , confirms only the dedication of the Braemar chapel to the Seven Maidens and its use as a family burying site by the Farquharson family. 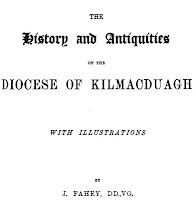 The writer of a paper on the Traces of the Cultus of the Nine Maidens in Scotland, is not entirely convinced of the identification of the Inverey chapel with the Irish maidens commemorated on May 24, and states on page 260 that there is 'some doubt' surrounding this claim by Bishop Forbes. Bishop Forbes was not the only commentator who attempted to identify these holy women, the 17th-century hagiologist, Father John Colgan, sought to equate them with a group of seven nuns who assisted at the sixth-century Synod of Drum Ceatt. I'm not sure though that his evidence is any more substantial, but at least it is interesting to note that a group of female monastics were recorded as participants at this Synod. 1. They are, as the Martyrology of Tallaght claims, associated with the locality of Inis Cealtra, the holy island of County Clare. I was under the impression though that this was a male foundation. 2. They are, as Colgan claims, associated with a location called Teach na ninghean, literally 'the house of the daughters' and are perhaps to be identified with the seven nuns of Tir-na-Fiachra Aine who took part in the Synod of Drum Ceatt. 3. They are, as Bishop Forbes claims, the Seven Maidens to whom a chapel in Inverey, Scotland, is dedicated. This theory would stand up better if the Scottish calendars recorded a feast day for these Seven Maidens on May 24th independently from the Irish. This does not, however, seem to be the case. The Seven Daughters of Ferghus, of Tigninghin Ferghusa, or of Inis-Cealtra, County of Galway. The Martyrology of Tallagh records Secht ningena Fergusa in Inis Cealtra, at the 24th of May. This is now known as Inis-crealtra, an island and parish in the counties of Clare and Galway. The Bollandists also record their festival, for this day. But Colgan seems to connect them with Teach na ninghean, in Connaught. He says, they were perhaps those seven nuns of Tir-na-Fiachra Aine, who assisted at the great Synod in Dromcheat, in the year 580. The extent of Ui Fiachrach Aidhne is shown on the Irish Maps, prefixed to the "Tribes and Customs of Hy-Many, commonly called O'Kelly's Country ". A festival in honour of the Seven Daughters of Fergus, of Tigh-inghen-Ferghusa, was celebrated on this day, as we read in the Martyrology of Donegal. Under the title of the Seven Maidens, they seem to have been venerated, likewise, in Scotland. An entry of St. Comman is registered, in the Martyrology of Tallagh, at the 23rd of May. The Bollandists quote the same authority, for this insertion of his name,at this date. No place, genealogy or title is afforded to distinguish him, from others bearing a similar name. 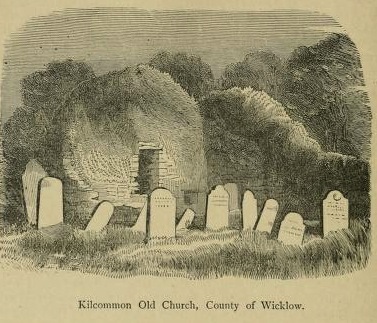 Quite convenient to the Dublin and Wicklow Railway, and about one mile from the town of Rathdrum, the old graveyard of Kilcommon rises on the side of a commanding hill. This place has been much used for interments. Several old trees and bushed grow around it. On the north side, there are only a few interments. On the south side, the graveyard is separated by a deep trench from the fields adjoining. An old ruined church remains within the enclosure. The east end is partly standing and veiled over with thick ivy plants. There is a small ruinous window in it, with a chiselled jam remaining, in which square punched holes are to be seen, as if intended for crossing iron bars. A small square recess is in this same wall, and near the window. The window was about 3 feet, 4 inches in length and 1 foot, 6 inches in breadth. A mere fragment of the south walls continues to show the outline, and in it are the apparent traces of a window, not far from the earth. The remains of the walls, levelled with the ground, only reveal the former extent of this old church. Interiorly, it measures 40 feet in length by 21 feet in breadth, and its walls were over two feet in thickness. The walls were built of granite. Of course, it cannot be asserted with any degree of certainty, this place had been connected with the present, or even with any of the other eleven Comans or Commans, noted in our calendars, at different days of the year. We find the name Comman, also, simply entered in the Martyrology of Donegal, as having been venerated on this day. St. Baoithin, of Ennisboyne, County of Wicklow. St. Brigid, daughter of Dima, or Diomman. At the 21st of May, the Martyrology of Tallagh has a Brighit inghen Dimmain. The Martyrologies of Marianus O'Gorman and of Charles Maguire place her festival at this date. The Bollandists also notice Brigid, daughter of Dimanus, at the 21st of May. We have not been able to discover any documentary evidence, which might tend to throw light on that locality, with which she had been formerly connected, or where, after death, she had been specially commemorated. On this day, Brighit, daughter of Diomman, had veneration given her, as we read, likewise, in the Martyrology of Donegal. St. Mac Laithbhe, of Donoughmore. At the 20th of May, we find a record of this saint, in the published Martyrology of Tallagh, as Mac Laithbhe Domnaighmoir. This latter word was the name of a place. Many localities, called Donoughmore, are known in various parts of our Island; so that it is difficult to discover that one, with which he had been connected. Marluithaes de Momech-mou is noted by the Bollandists, at the 20th of May, and for this feast, the Tallagh Martyrology is quoted ; but, we suspect, the reference has been taken incorrectly from that source. The Martyrology of Donegal, on this day, registers Mac Laithbhe, of Domhnach-mor. as having been venerated. In the Martyrology of Tallagh published and unpublished —we find this saint's festival set down, on the 19th of May. Marianus O'Gorman and Charles Maguire mention this holy virgin, likewise, in their Calendars, and at the same date. According to the accounts of ancient writers, St. Patrick had a sister bearing the name. But, as there were two other Richellas, in our list of Irish Saints, it may be difficult to determine the virgin, whose festival is this day commemorated. One of these was St. Richelia, the daughter of Attractus, and of King Leagaire's race. Her descent will be found, in the "Menelogium Genealogicum," cap. 3. The other was Richella, or, according to others, Richenna, called also Reynach, or Regnacia. She was daughter to Fintan, and sister to St. Finnian of Clonard, as may be seen in a Life of the latter, published by Colgan. Her Life will be found, at the 18th of December. There was a certain church or monastic establishment, in the territory of Lugne, within the Connaught province, and there a St. Richella is said to have lived. Kill-Richille, in the diocese of Clonfert, was probably connected with the residence of a saint bearing this name; yet, it is not easy to determine that particular Richella—if indeed she was one among the three mentioned—who had been venerated in either of those places. In a list of St. Patrick's five sisters, the name Cinnenus is substituted for Richella, by Ussher; and Colgan found, likewise, in an old fragmentary vellum Life of St. Patrick, the name of a fifth sister to the Irish Apostle, as Cinnenus, and not Richella. But, as the form of the name Cinnenus is not applicable to a female, Colgan thinks we ought rather read, Cinne noem, signifying St. Cinna. Now, it would seem, that Richinne has the signification regia Cinne; wherefore, Colgan argues, it is possible, the doubtful word may be properly resolved into Richinne or Richella. The same researchful hagiologist tells us, he could not discover, whether or not Richella became a mother. It might come within the range of possibility, also, that Barbanus, or Banbanus, of Mag-slecht, and a kinsman of St. Patrick, had been her son; although, Colgan did not know, whether this relationship had been through a brother or sister, or in what collateral line. This, however, is only a very groundless conjecture; and, also, any attempt to represent our saint as a sister to the illustrious St. Patrick must prove equally futile. In the Irish Tripartite Life of St. Patrick, it may be observed, the saint left by him, over the church at Domhnach-Maighe-Slecht, is called Mabran Barbarus. The Bollandists notice the feast of Richella, an Irish virgin, at the 19th of May. Little is known, however, regarding her place in our ecclesiastical history. One of the most illustrious of St. Kentigern's disciples was St. Conval, who inherited in an eminent degree the zeal and sanctity of his great master. He was the son of an Irish chieftain, and forsaking his country and friends, through the desire of winning souls to God, sailed to the banks of the Clyde, and enrolling himself among the clergy of St. Kentigern, soon proved himself a devoted missioner, and became a bright ornament of the Scottish Church. In many of the mediaeval records he is styled Archdeacon of Glasgow, and by his untiring labours he merited to be honoured as a second apostle of that great city. Each memorial of the saint was long cherished by the faithful to whom he ministered. The rock on which he landed on the sea-shore, and on which in after years he was wont to pray, was held in the greatest veneration, and several churches erected under his invocation attested the reverence and fond affection in which his hallowed memory was held. It is recorded that he visited his countryman, King Aidan, of Dalriada, and was welcomed by that prince with the highest honours. The purport of St. Conval's visit was probably to secure the aid of King Aidan for the religious works in which he was engaged south of the Clyde; and we are further told that, at that pious monarch's request, St. Conval passed into the Pictish territory, and there gained many souls to God. He also visited St. Columba, and seems for a time to have been associated with that great saint in his missionary labours. Rt. Rev. 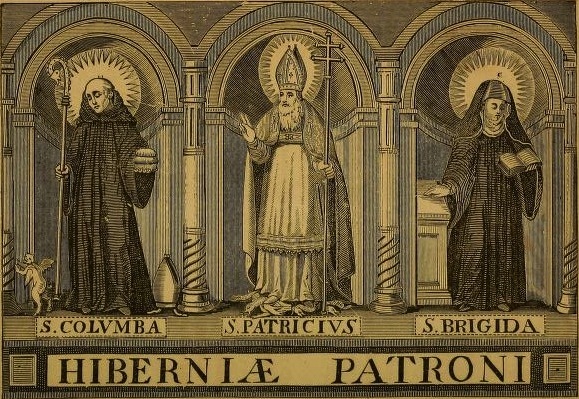 P. F. Moran, Irish Saints in Great Britain (Dublin, 1879), 156-159. St. Siollan, Bishop of Daimhinis, or Devenish Island, County of Fermanagh. ...The death of St. Molaisse, the founder of Devenish, is assigned to A.D. 563, and he was succeeded by St. Natalis, or Naal, the period of his demise not being stated. The next in succession, as revealed in our Annals, was St. Sillan. His term of incumbency seems assignable to the seventh century, and with the abbatial it is likely he exercised episcopal functions. We learn, that the present bishop died, on the 17th of May, A.D. 658, according to the Annals of the Four Masters. Under the head of Daimhinis, Duald Mac Firbis enters, Siollan, bishop of Daimhinis. Summer finds Devenish clothed in rank, luxuriant herbage. Except in the grey walls and the solitary hut of a herd, no trace of man is there to be seen. But, when the grass dies, and when winter has stripped this ancient home of its cattle, food, and verdure, the old gardens of the community can be traced, in many a boundary line. Even the presence of herbs and plants, which, though old in the soil, are not found in other islands of the lake, or on the surrounding hills, is indicated by the solitary habitant who acts as guide, and who lives upon this insulated spot. This suggests that although he may today be an obscure figure, he retained a prominent reputation within his own community. St. Maclaisre, Abbot of Bangor, County of Down. The Martyrology of Tallagh records this saint, at the 16th of May, as Mac Lasre, Abbot of Bangor. At the same date, the Bollandists enter Maclasrius, Abbas Benchorensis, in Ultonia. Allusion is made to him, by Father John Colgan, as having died, during the reigns of Conall and Kellach, joint sovereigns over Ireland. The "Chronicum Scotorum " places the death of Mac Laisre, Abbot of Bennchair, at A.D. 644, the year when it is stated Bede was born. On this day, Mac Laisre departed to a brighter and a better world, in the year 645, according to the Annals of Ulster, and of the Four Masters. The Martyrology of Donegal registers on this day, as having veneration paid him, Maclaisre, Abbot of Bennchor. An entry is found, regarding Findchad, a Bishop, in the Martyrology of Tallagh, at the 16th of May. The Bollandists simply note Findchadus Episcopus, from the same source, and for the same date. On this day was venerated Fionnchadh, Bishop, as we read in the Martyrology of Donegal. "O Saint of God! How can I live in my own country and confess my sins to thee?" "Go to the holy man whom I see every Sunday night, standing with the angels before the tribunal of Christ." "Saint, indeed he is, and comely, and of your own kindred, with florid complexion and bright eyes, and a few grey hairs now beginning to appear." "I know no such person in my country except St. Fintan of Clonenagh." Adamnan relates also the following regarding the Vision of Holy Angels who carried off to Heaven the soul of the Saintly Bishop Colman Mac Ua Laoigshe:- Another time while the brothers were dressing in the morning and about to go to their different duties in the monastery, the Saint (Columbkille) bade them rest that day and prepare for the holy sacrifice, ordering also better fare for dinner, such as was given on Sunday. "I must," said he, "though unworthy, celebrate today the holy mysteries of the Eucharist out of respect for the soul which last night went up to heaven beyond the sky and stars, borne thither by choirs of holy angels." The brethren, in obedience to his command, rested that day, and after preparing for the sacred rites, they accompanied the saint to the church in their white robes as on festivals. And when they were singing the usual prayer in which St. Martin's name is commemorated, the Saint, turning to the chaunters, said: "You must pray to-day for Saint Colman, Bishop." Then all the brethren present understood that Colman, a Leinster Bishop, the dear, friend of Columba had passed to the Lord. A short time after, some persons who came from the province of Leinster, told how the bishop died the very night it was revealed to the saint. A record of Laisre is found in the published Martyrology of Tallagh, at the 14th of May, and it is also in the Franciscan copy. From the same source, the Bollandists enter at this day the festival of St. Lasra, or Lassara, with a reference to what had been said regarding Cassara Virgo—evidently a mistake for Lassara Virgo—placed among the pretermitted feasts, at the 11th of May. On this day, veneration was given to Lassar, as we read, also, in the Martyrology of Donegal. St. Moeldod, or Moeldodius, Abbot of Mucnaimh, or Mucknoe, County of Monaghan. At this date, in the published Martyrology of Tallagh, we meet with the name of Moeilidoid; while, a nearly similar entry is in the Franciscan copy. The Bollandists have given some brief Acts of this saint, at the 13th of May. Father Godefrid Hennschenn was the compiler. We are informed, that St. Moeldod was a member of the great house of the Orgiel dynasts, representing the three Collas. It will be difficult, however, to determine the exact time, when he flourished; but, we may partially approximate to it, by following the genealogical tree of his family. St. Moeldod, or Maldod, was son to Eingin, son of Aldus, son to Fiach, son of Fiech, son to Eugene, son to Brian, son of Muredach Meth, son to Imchad, one of Colla Dacrioch's sons. We have few particulars to state regarding this saint. We are told, however, that he was Abbot of Mucmaimh, in Orgiellia, or Uriel; and that place has been converted by Archdall into Monaghan, said to have been anciently called Muinechan. The Rev. Dr. Lanigan asserts, that it was well known an old monastery stood at Monaghan—which he identifies with Mucnaimh—and, of this, Moeldod was Abbot, if not the founder. Such identification, however, is quite incorrect... Mucnamh sometimes written Mucshnamh— is now identified with Muckno, a parish in the barony of Cremorne, and county of Monaghan. Chiefly within its bounds is the beautiful lake of Mucno, with its soft and swelling shores richly wooded, and having pretty isles and islets to diversify its fine landscapes... It is situated, near to Castleblaney. The time, when this saint lived, has not been specified. The feast of a St. Maldod, Confessor, in Ireland, occurs, likewise, on the following day, May 14th. At this date, in his Scottish Menology, Dempster speaks of Maldod, Bishop, in Ireland, a Scot by birth, and a man distinguished for his great holiness, remarkable patience, and the influence of his virtuous example. As a proof of these assertions, he adds the letters M.C. ; by which he asserts, the Carthusian Martyrology to be indicated as authority, Canisius, and Adam Walasser. The Bollandist writer, in the "Acta Sanctorum," had not seen this latter work; but, in the former authors, he found nothing regarding Moeldod's episcopacy, or about his Scottish origin. It is supposed, however, that this saint was identical, with an Abbot, who ruled over Muc-naimh monastery. His feast was assigned to this date, by Richard Whitford, in his English Martyrology. Also, on this day, the Martyrology of Donegal, registers the name Maeldoid, of Mucnamh, as having been venerated. AILITIR, OR ELITIR, OF MUIC-INIS, LOUGH DERG, AND OF CLONMACNOISE, KING'S COUNTY. The Festival of Ailithir, with a eulogy, is entered, at the 12th of May, in the Feilire of St. Aengus. His name is elsewhere found Latinized as Alitherius, seu Peregrinus de Mucinis. Yet, we cannot be assured, that this was his proper name. However from the sequel, it seems likely, that he has been identified with a holy man so named, and belonging to one of the Muskerrys, in the south of Ireland. An entry, Ailitir Muccinsi, is found in the published Martyrology of Tallagh, and in the Franciscan copy, at the 12th of May. The Martyrology of Marianus O'Gorman notes, at this date, likewise, Elithir of Muicinis, on Loch Deirg (Derc), now Lough Derg, in the Shannon. It would seem, that both here, and at Clonmacnoise, his memory was held in veneration. The word, Ailitir, or Elithir, signifies "a pilgrim;" and, hence, it may not necessarily be a proper name. At the year 595, however, the Annals of the Four Masters state, that Ailithir, Abbot of Cluain-mic-nois, died. He was the fourth Abbot, having succeeded Mac Nissi, who departed this life, on June the 12th, A.D. 585. The Ailithir, there mentioned, has been identified with the present saint. The Annals of Ulster record his death, at A.D. 598; while, those of Tighernach and the "Chronicum Scotorum" place it, at A.D. 599. The latter authority states, that his family was of the Muscraidhe. This day, the Martyrology of Donegal records a veneration paid to Elitir, of Muic-inis, in Loch Derg-derc. Under that name, it is difficult to find it there, as it does not appear, on the Irish Ordnance Survey Maps. St. Laeghair Lobhar, or Lughaire, the Leper. A notice of Laeghair Lobhar is found, in the Martyrology of Tallagh, at the 11th of May and, immediately preceding it, there is an entry, Luguir, Infirmitas. We cannot doubt, that there has been some error of transcription, or misplacement, here, and not met with in the original document. The Bollandists copy from the Tallagh Martyrology, Lugarius in Fir. et Leogarius Lovar seu leprosus, as if they were distinct persons. At the 16th of March, when treating about St. Finan the Leper, Colgan indicates, in a note, that Lugarius Lobhar, i.e., leprosus, had a feast, on the 11th of May. We cannot find anything more distinctive regarding him. For this day, a festival in honour of Lughaire, a Leper, is set down, likewise, in the Martyrology of Donegal. St. Mumbolus, or Mombolus, Hermit and Abbot of Lagny, France. In the time of this holy man, a pious emulation seized the Christian Irish and Scots to leave their homes, and to become evangelists, among people living on the Continent. St, Mumbolus or Mombolus was born in Ireland, probably in the seventh century. Afterwards, he went over to France. There, he entered the Monastery of Lagny, as a disciple to St. Fursey. But few particulars regarding him have been recorded, by Miraeus and Molanus, who place his festival, at the 18th of November. After the death of his master, although third in succession, he became principal over this monastery. But, his government of the inmates seemed to them rather austere; and, a confederacy of many among the community having been formed against him, he withdrew, in company with some fervent companions, to a place called Condrynus, near the River Isara, now known as L'Isere. Here, he lived the life of an anchorite, and he happily departed to a better state, towards the close of the seventh century. At the 9th of May, Dempster has the Deposition of Mombulus, Abbot of Lagny. It is probable, he died, on the 9th of May; and, at the same date, Wion, Dorgan, Ferrarius, as also an Irish authority [Father Stephen White], have noted his feast. The Bollandists commemorate him at this day; but, as they state, these authorities cited, and most of the other saint-writers, have another feast for him, at the 18th of November. The relics of this saint were removed, from his place of deposition, by the Bishops of Cambray and of Noyon, about the year 831. In the published Martyrology of Tallagh, we find no entry of the present saint, or of his feast. The copy of the Tallagh Martyrology, belonging to the Dublin Franciscan Convent, has a notice, however, at the eighth of the May Ides about Comman, while his place is denominated—probably as given in the later Martyrology of Donegal. The locality, denominated Tig-mac-Fionnchain, does not appear to be known; nor do we find any corresponding nomenclature for it, among the parochial or townland etymons, on the Ordnance Survey Maps for Ireland. The Bollandists have a feast for Communus de Teghune Fendchain, sive de domo filii Fianthaim, but, it seems pretty certain, they have mispelled some of the letters in the original entry, drawn from the Tallagh Martyrology. The Martyrology of Donegal registers a festival, on this day, in honour of Comman, of Tigh mic Fionnchain. The 5th of May is the festival of a nameless saint who is known as An Inghen Buidhe a Drom Tarbh, i.e. "the yellow (haired) daughter of Dromtariff" ("the ridge of the bull"). The local tradition is that SS. Lateerin of Cullin, Lassera of Killossory, in Kilmeen parish, and this "yellow-haired daughter," were sisters who led an eremitical life in those three respective and adjoining parishes in Duhallow. One night the angels came down from heaven and made a tochar i.e. "causeway," from Killossory to Dromtariff, and thence to Cullin, so that those holy women might the more easily meet and converse with one another. The "patron day " at Killossory is now discontinued, but a large "patron" is still held at Dromtariff holy well on each recurring May 5. 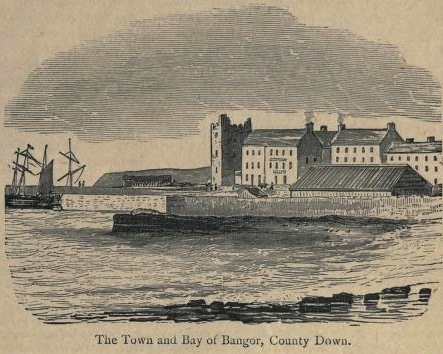 The locality of "the yellow-haired daughter's" holy well — about one hundred and fifty yards south of Dromtariff grave-yard and overlooking the majestic Blackwater — is shown on the Ordnance Townland Maps for the county Cork, sheet 31. Journal of the Cork Historical and Archaeological Society, Volume II (1896), 319. St. Inneen, Dromtariff Old Church, County of Cork. In the diocese of Kerry, there is an old church at Dromtariff, in the parish so called, and county of Cork, where a female saint, called Inneen, was venerated, on the 6th of May. According to popular tradition, she was the sister of St. Lateerin, who is likewise popularly known, at Cullin, in that part of the country, and to an older sister, who lived at Kilmeen. It it stated, according to a local tradition, that the angels of Heaven made a road, one night, from Kilmeen through Dromtariff and on to Cullin, so that the three sisters might the more conveniently visit each other once every week. Much obscurity hangs over their history, as their celebrity appears to be merely local; although, the people, in their part of the country, have a great veneration for those sisters. The simple entry of Senan's name is in the published Martyrology of Tallagh at this date; and, a similar record is found in the Franciscan copy. The Bollandists, who enter his feast, on the same authority, and at the 5th of May, have remarked, that Colgan sets him down as an Abbot; although, when or where he exercised such an office, and his acts, are not recorded. The Festilogy of St. Aengus, Marianus and Maguire are also quoted. On this day was celebrated a festival in honour of Senan, as we find entered in the Martyrology of Donegal. On May 4 the earliest Irish calendars commemorate a Saint Siollan, at whose name the scholiast in the Martyrology of Oengus has added, 'this is Sylvanus the deacon'. In his account, Canon O'Hanlon claims that the 17th-century hagiologist, Father John Colgan, sought to identify today's saint with a monk of this name found in the Life of Saint Berach of Kilbarry. Although he does not mention it here, the same claim was made in relation to another saint of this name, commemorated on March 28. On that occasion I reproduced the relevant chapter from the Life and will do so again here, following O'Hanlon's account of Saint Siollan, the Deacon, from Volume V of his Lives of the Irish Saints. A festival was celebrated on this day, as we read in the Martyrologies of Tallagh and of Donegal, in honour of Siollan the deacon. This account is taken from the Felire Aenghuis. It has been thought by Colgan, that the present St. Sillan may be identical with one, mentioned in the Life of St. Berach, of Kilbarry, who is venerated, at the 15th of February. The Bollandists have the feast of St. Sillan entered, at this date; and they give a similar reference, as if her were identical with that monk of St. Berach, who had been killed by robbers, and who had afterwards resuscitated, through the miraculous agency of his venerable superior. This miracle was wrought, at a place called Rath-ond, which has not been identified. In the sixth or seventh century, St Sillan flourished, if the identification in question be admitted. This Natalis occurs, also, in the Kalendar of Drummond, as Sillan, Deacon, a holy confessor, at the 4th of the May Nones. The date of her birth is not given; but by comparing her genealogy with that of St Colman Mac Duagh, which shall be hereafter given, it will be seen that she stands the same number of degrees from their common ancestor, Eochaid Breac, as does Cobhtach, whose son Conal was great-grand-father of St. Colman Mac Duagh. Hence it may be fairly assumed that Cobhtach and St. Sourney were contemporaries. And as Cobhtach's father fought in the battle of Claonloch, A.D. 531, we can justly assume that St. Sourney belonged to the middle of the sixth century. She was born of the same princely tribe of which St. Colman was bom later in the same century. She is identified by O'Donovan as the same female Saint who is now "corruptly called St. Sourney, to whom there are wells dedicated in the districts of Aidhne, and whose church still stands in ruins in the great island of Aran, in the Bay of Galway." And we are told by O'Flaherty's learned editor that "this church is held in the greatest veneration by the islanders." But there is more to commemorate and honour the name of St. Sourney in Aidhne than the holy wells to which O'Donovan refers. St. Sourney's Church may still be seen in a fair state of preservation at Dromacoo, in the present parish of Ballindereen, at a distance of about three miles and a half from Kinvara. Rev. 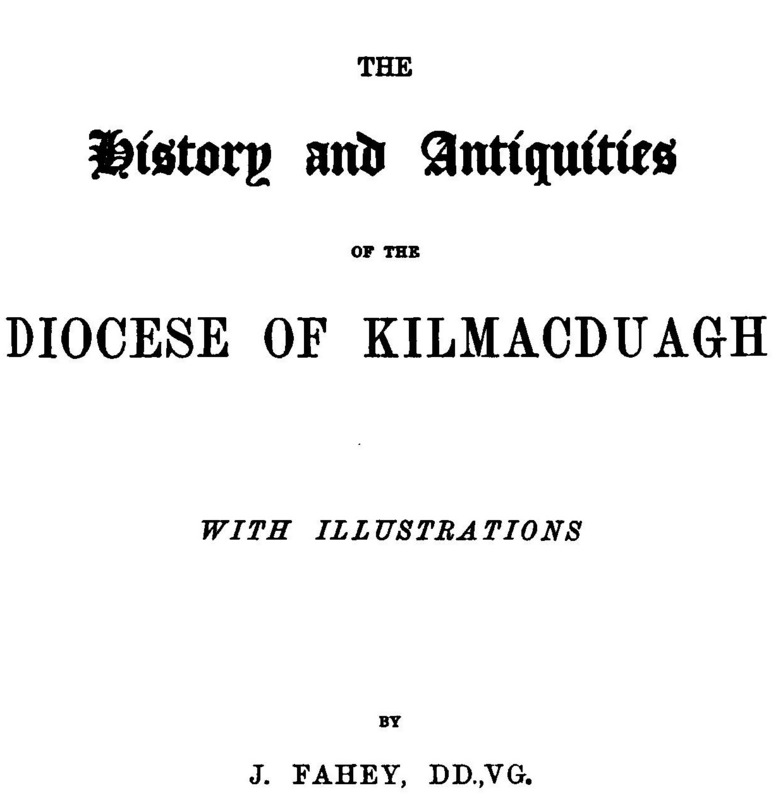 J. Fahey, The History and Antiquities of the Diocese of Kilmacduagh (Dublin, 1893), 32-34.